This season has been off to a mostly good start. 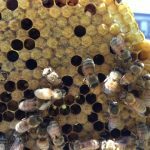 All of the colonies have been doing well and growing quickly. 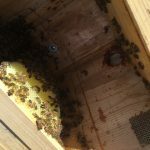 The plan is to get out to the hives every two weeks when I can to keep an eye on their growth. 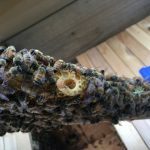 In the past, I had a first year colony that grew quickly and then became nectar bound. 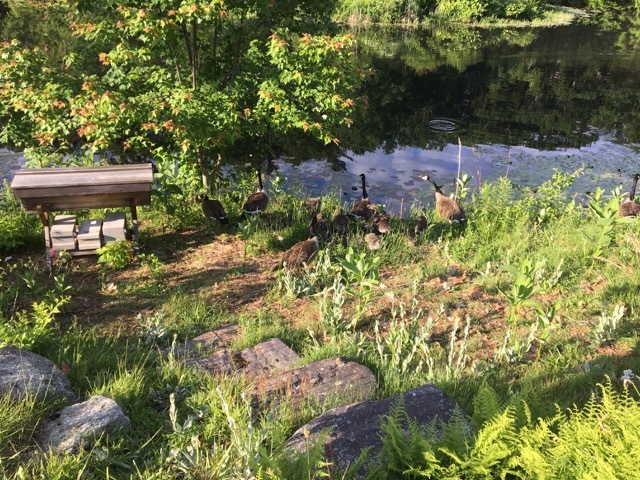 They swarmed in late July or early August and the remaining colony did not have enough time to build up for winter. 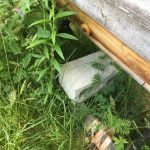 In the hopes of not having that happen again, I am trying to be more aware of what is going on inside the hives. The Willow Hive was the first stop of the morning. The weather was a little cool, but not bad and the sun was shining. It’s June 8th and my last inspection was May 21st. 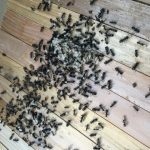 For us here in Massachusetts this is the start of swarm season. 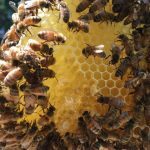 Since these are all new colonies, there is a chance that they will not want to swarm yet. It’s good to keep an eye on things though. 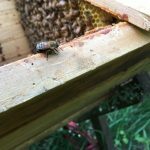 The Willow Hive is going to keep me on my toes! They are on twenty four bars and I added six empty bars for them. There are capped brood on twenty two of the twenty four bars, larvae on fifteen, and eggs on thirteen of them. 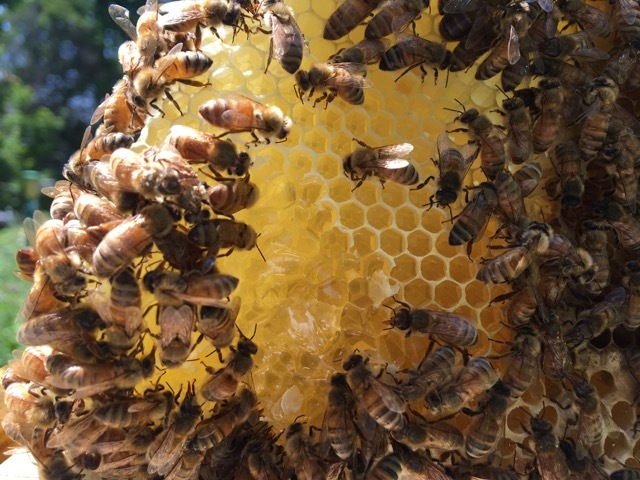 Twenty three of the bars have nectar on them and fifteen have capped honey. I was also shocked to find twenty seven queen cups! Only a couple of them had eggs or larvae in them, but there are so many here! 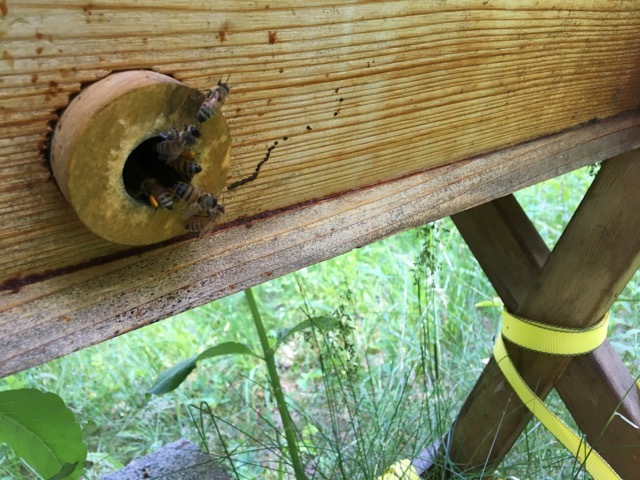 The goal for this hive is to do a split soon, to try to prevent them swarming and leaving. 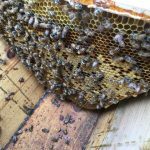 The Willow Hive queen is a Varroa Sensitive Hygienic queen and this colony is very calm and easy to work with. 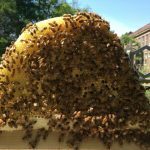 If we can split them before they swarm than we will have another colony with similar qualities. At this point, I am not ready to take on another colony. 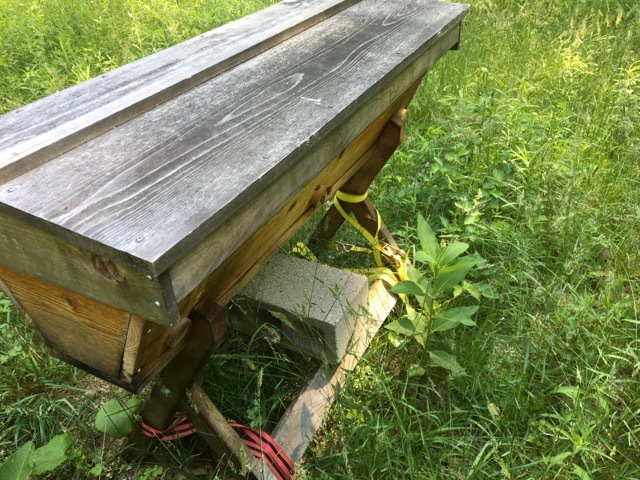 Luckily, I know a beekeeper that has just finished building his first top bar hive. I will arrange with him to do a split. This will be very exciting for me since I have never done one before. 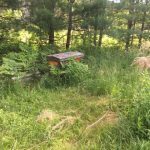 At the Orchard Hive I was a little baffled. 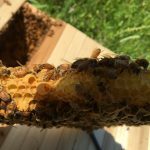 The bees were calm and easy to work with, but their buzz sounded strange. They were not angry or aggressive, but they sounded different. They are on nineteen bars and two of them were still empty. 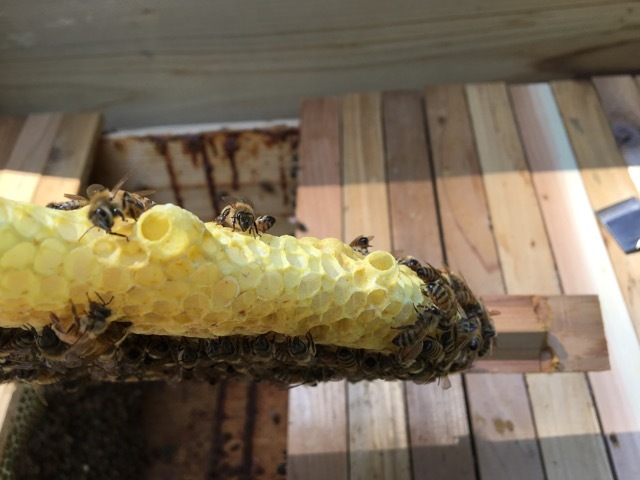 There were four bars that had small pieces of comb on them. 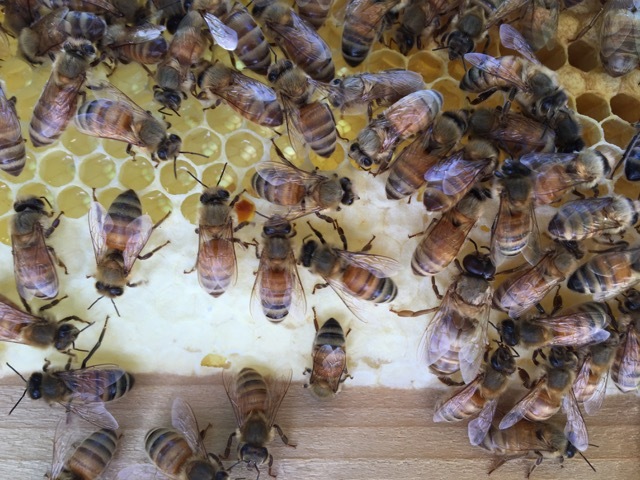 Eleven bars had nectar on them and ten bars had capped honey. 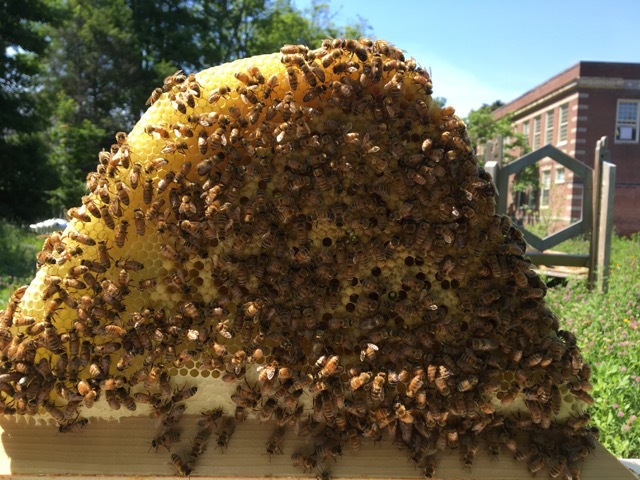 There was also plenty of pollen in the hive and lots of bees bringing pollen in. The thing that was missing was new brood. 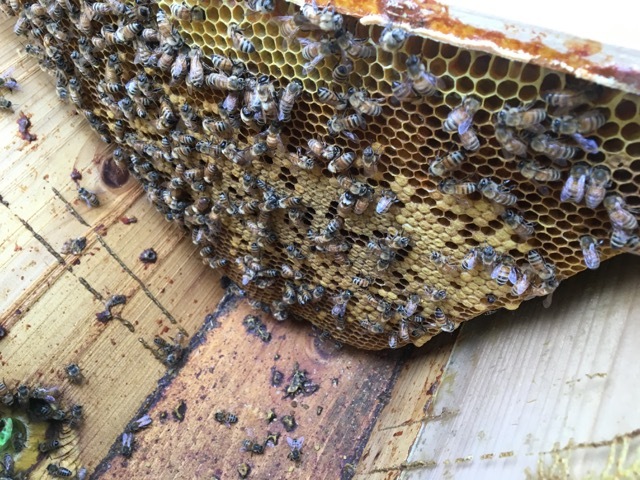 There was capped brood on eight of bars, but no larvae or eggs. 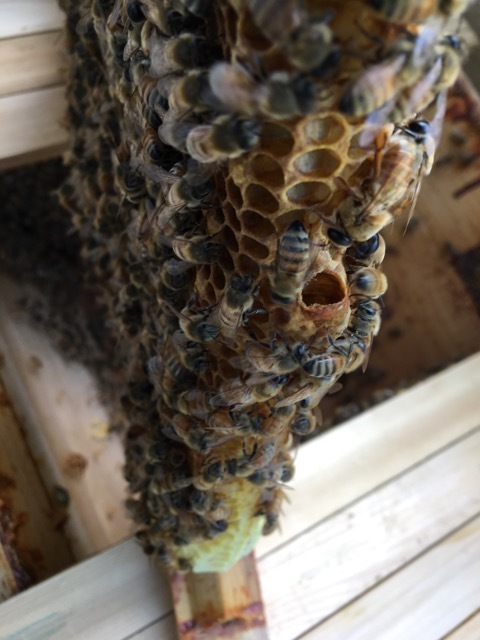 I found what looked like two queen cups, but both were ripped open. Then I saw her, only for a moment, but I saw her. 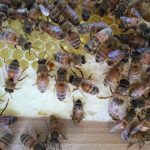 A new, unmated queen! She was very small and quite fast, so I only got a short glimpse of her. Talk about exciting! 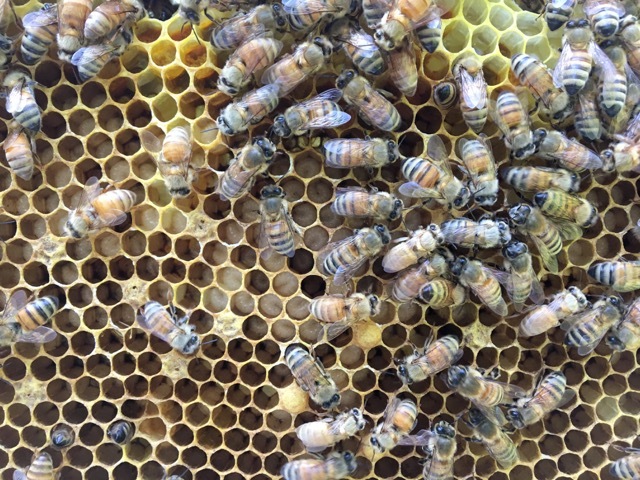 A new queen in here. Now she just needs to get out and mate. 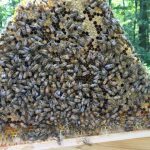 Once she is mated, this hive will feel better again. 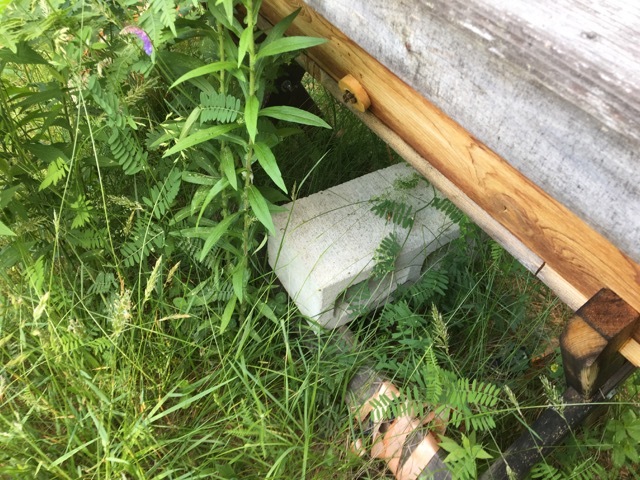 The Meadow Hive was wasp nest free, but Orchard Hive had a small wasp nest being started. I removed that from the lid and destroyed it. 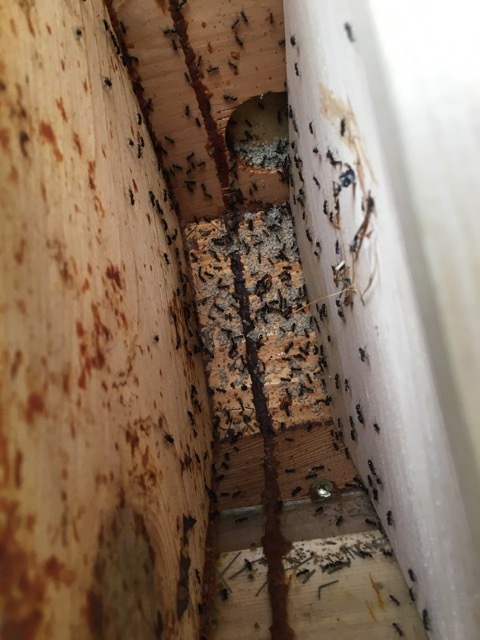 Then I had to deal with the ants in between the divider board and the end of the hive. 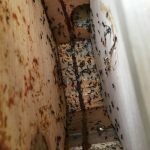 The ants usually nest in the window, but they seem to like the inside of the hives this year. 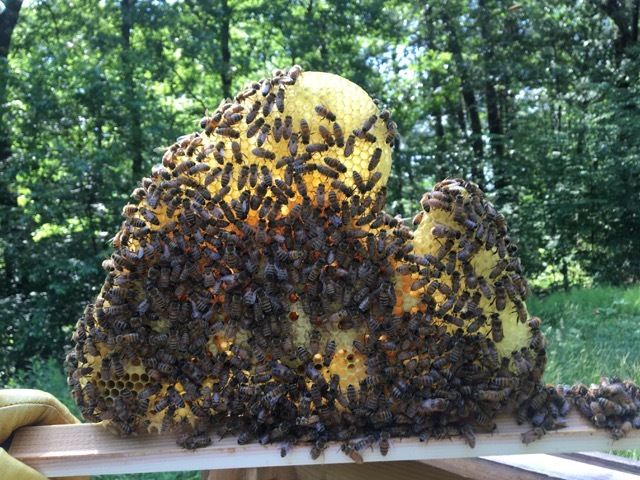 I will come back to the Orchard Hive in a week or so to check in on the new queen. 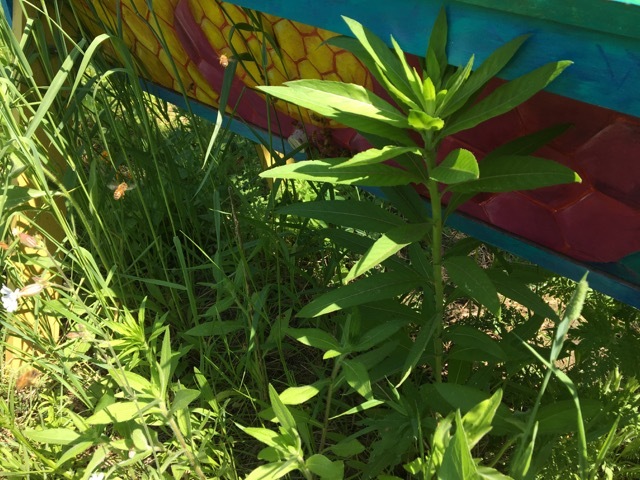 At the Healing Garden Hive the bees look good, but they are not growing as quickly as I had expected. This colony is on twenty three bars, three of them were empty, and five of them were not fully drawn out. Every bar that had comb, had nectar on it. 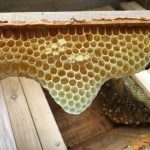 They are not making capped honey yet. 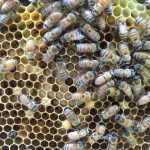 Nineteen of the twenty bars with comb on them had capped brood, thirteen had larvae, and five had eggs. I am not sure, but there may have been more eggs. It was difficult to see them. I found the queen and twelve empty queen cups. 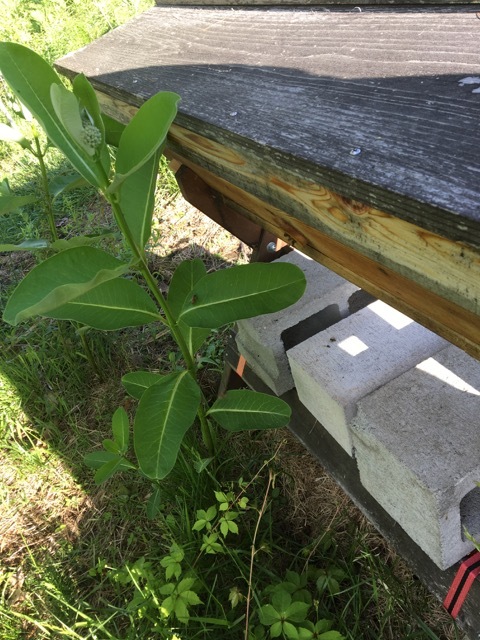 Even though their growth is slow, I added five empty bars for them. 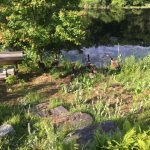 It’s early in the season and there is a lot in bloom right now. I want to make sure that they have enough space to grow. 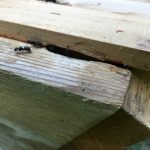 There was a surprise for me when I opened the lid, a colony of carpenter ants on top of the bars! 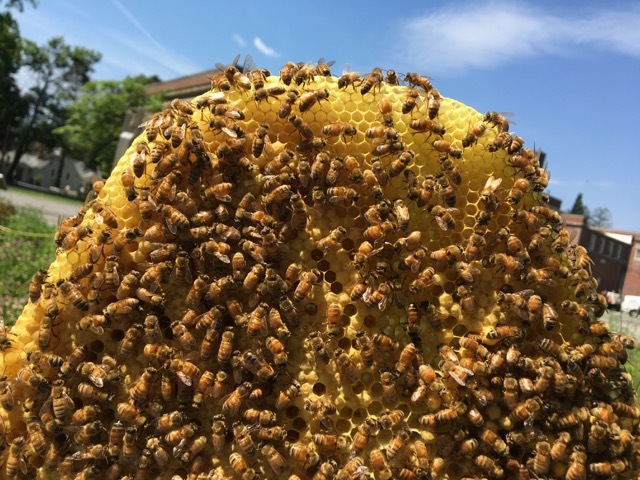 It was a fairly large colony there. 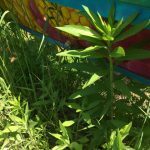 I took some of the weeds from around me and made a brush to sweep them off of the bars. 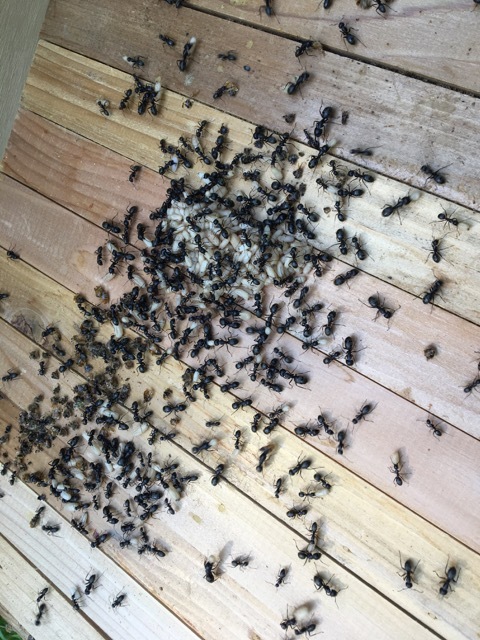 The bees were also attacking the ants and trying to get rid of them. Once I had brushed them away, I saw that they had damaged one of the divider boards. 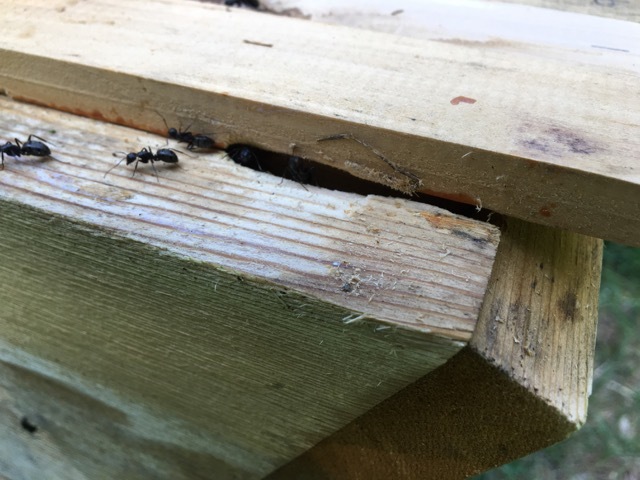 There were even more ants between the divider board and the end of the hive. I will have to deal with them next time. 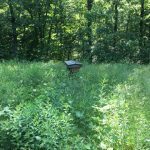 The Meadow Hive is the second hive that is exploding! 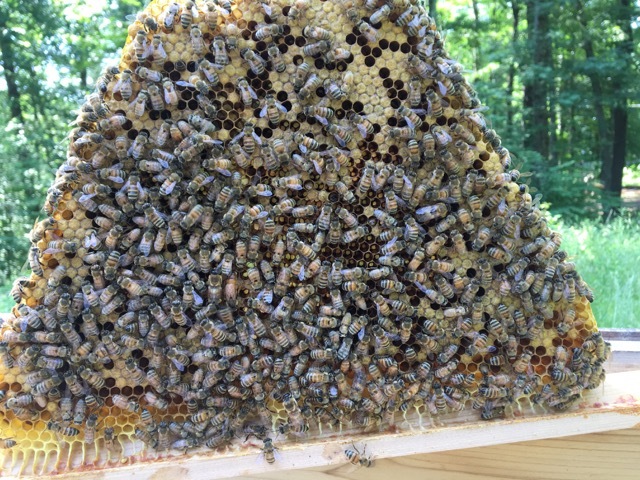 This is such a big colony already! 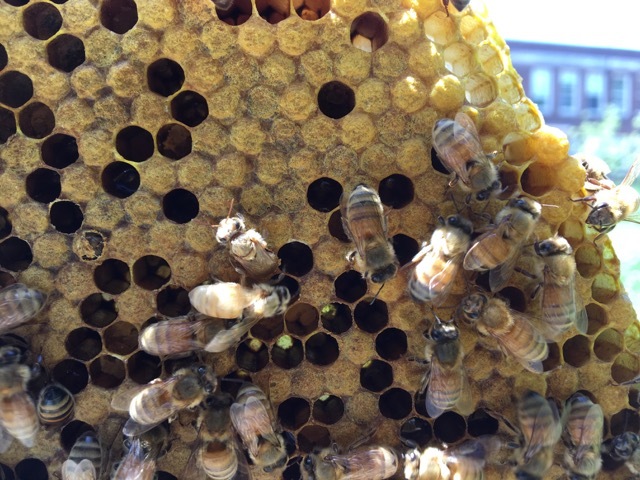 They are on twenty five bars, every single one is completely drawn out and has nectar and capped honey on them. 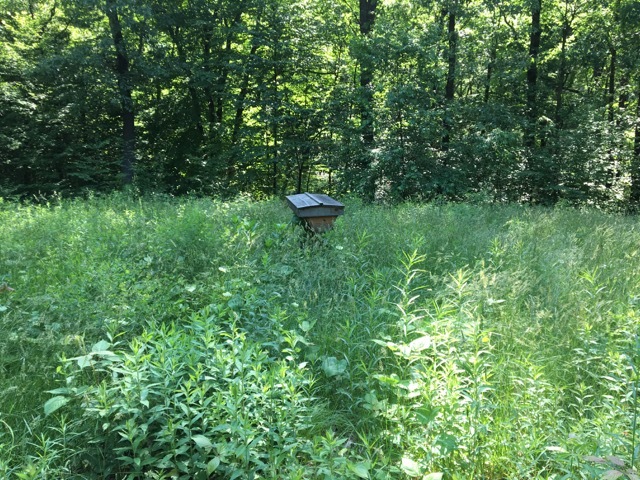 If I am not careful, this hive will become nectar bound. I added five more empty bars for them to build on. Now there are only spaces for two more bars once I remove the divider boards. 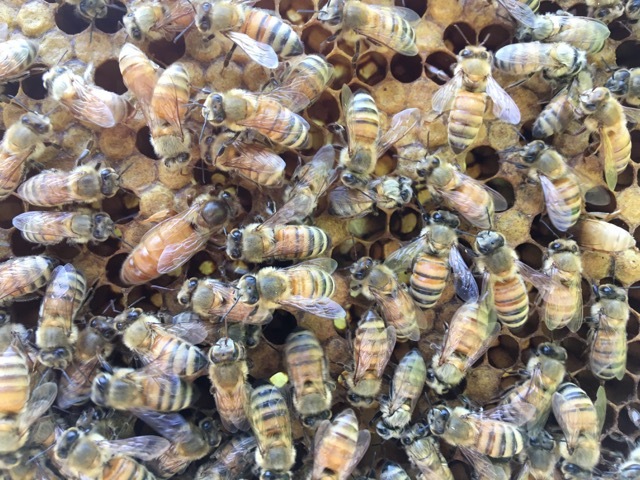 This time I did not find the queen, but there was plenty of evidence of her. 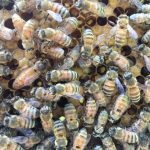 Nine of the twenty five bars had eggs, thirteen had larvae, and twenty four of them had capped brood. 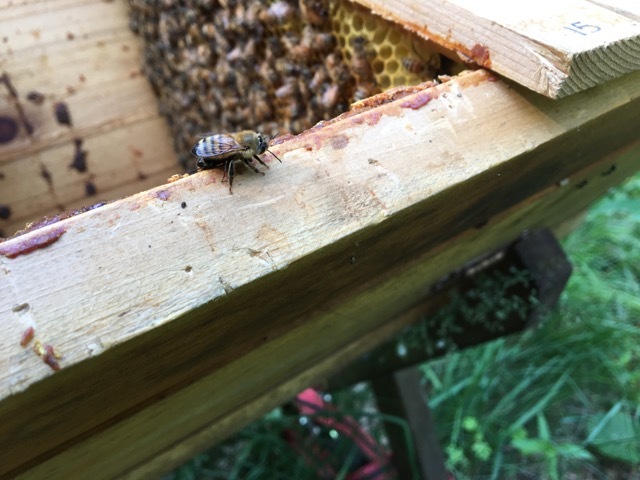 This queen is working hard! 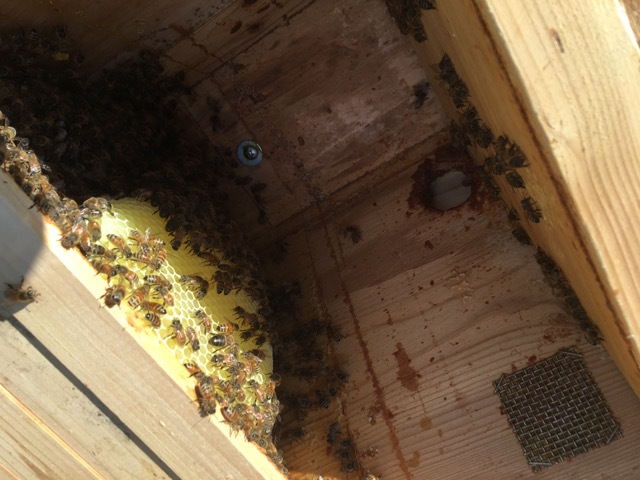 There were two empty queen cups on one of the bars, they were just the small practice cups. 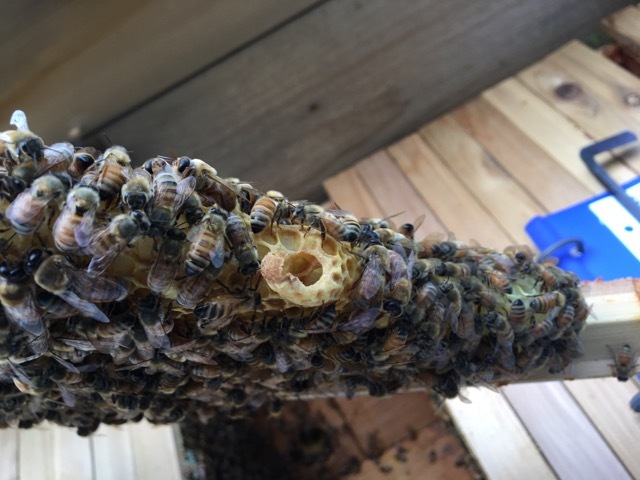 Today this colony was a little testy, but they were still easy to work with. 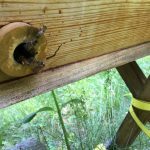 I think that they were not happy with me because I was having so many issues with the bars. 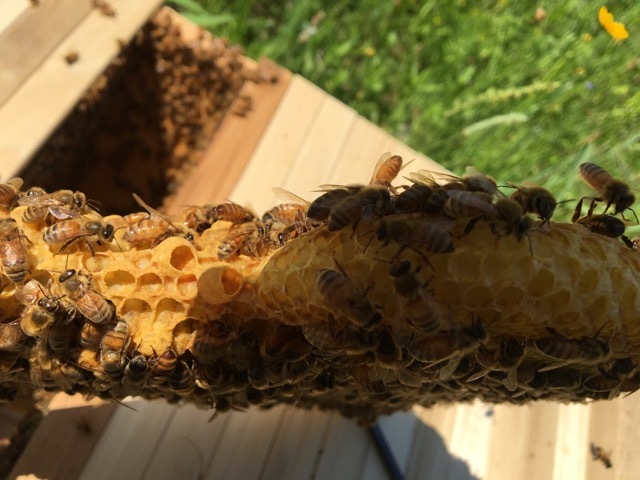 This hive is the Gold Star Honeybees hive and I am not used to working with these bars. 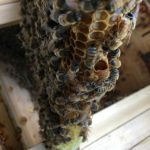 They feel different than the Bee Thinking bars that I have been using. 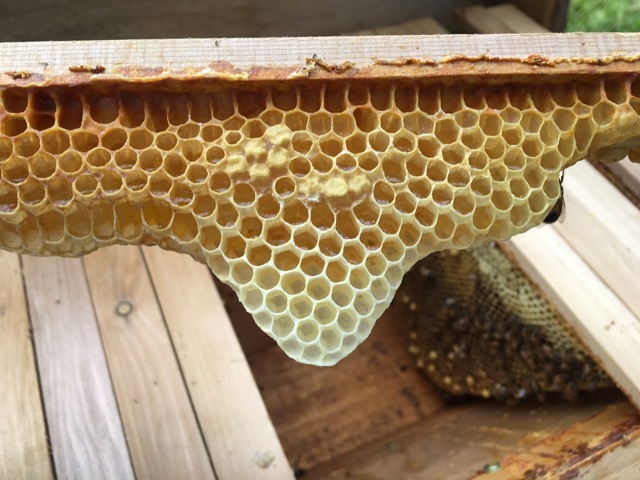 The other thing that I noticed is the hive is angled a little differently. 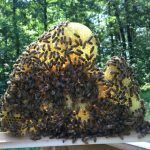 This has led to me squishing bees even though I am trying really hard not to. 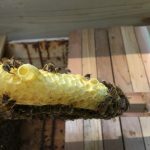 Understandably, the bees are upset with me when that happens. I will need to figure out the best way to handle the bars. I wasn’t prepared for it to be that different. 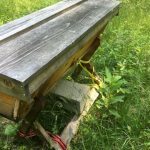 I have been working with the Bee Thinking hives and bars since the beginning so I think that I am just used to how to handle the bars in those hives. It’s interesting that it would feel so different. I am sure that it will take a little time, but I will get better at working with these bars too. With the other bars, I have developed a flow when I am working them and I find the process very smooth. 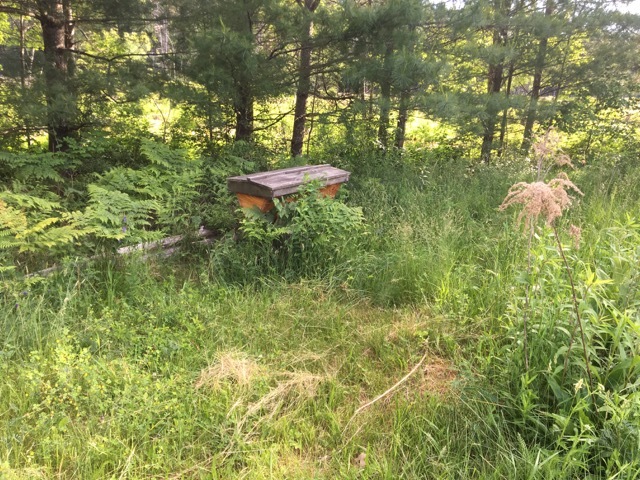 I also really like the fact that I am able to inspect the hives without squishing bees. 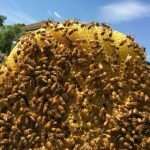 The bees appreciate it too!